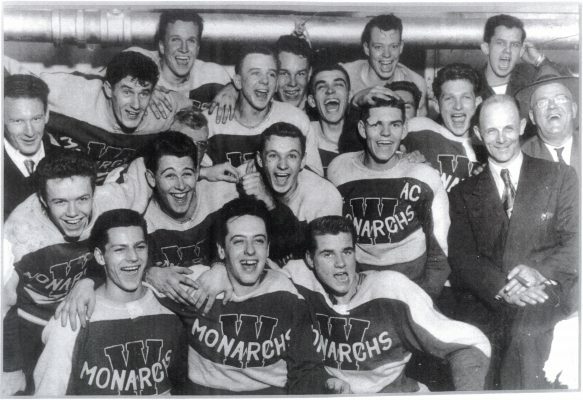 The 1951 Winnipeg Monarchs had a very difficult road in order to win the Abbott Cup emblematic of the Western Canada junior hockey championship. First of all, Monarchs had to beat the two-time defending champion Brandon Wheat Kings in the Manitoba Junior Hockey League final that went six games. Next up were the Thunder Bay champion Port Arthur Bruins. The Monarchs won a tough back-and-forth series, 4 games to 3 at the Winnipeg Ampitheatre. The Regina Pats from the Western Canada Junior Hockey League were the Monarchs' opponents in the Western Canada final for the Abbott Cup. The series went eight games with the Monarchs triumphing with an 8-4 win. The Monarchs advanced to the Canadian final for the Memorial Cup that was played in Winnipeg and Brandon. The Monarchs would bow out in four straight to a powerful Barrie Flyers squad.